Skin cancer is the most common type of cancer in the U.S. and its incidence is increasing. Each year, there are 3.5 million cases of skin cancer diagnosed. In the course of a lifetime, 1 in 5 Americans will develop skin cancer. Of all body locations, the head and neck region is the most commonly affected area. Treatment of skin cancers usually involves surgical excision. 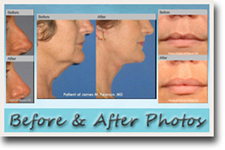 Reconstructive surgery may be indicated to minimize any resulting deformity. Reconstruction involving the face and facial structures is particularly delicate given the visibility of this area and its impact on one's appearance and social interaction. 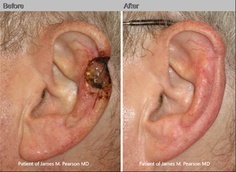 Dr. Pearson's practice offers skin cancer reconstruction as well as diagnosis and treatment of suspected or confirmed skin cancers on the face, neck and scalp. 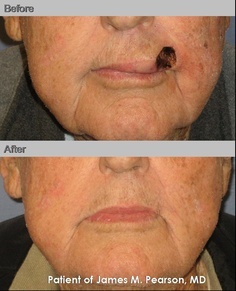 A patient describes her experience with skin cancer reconstructive surgery performed by Dr. Pearson. 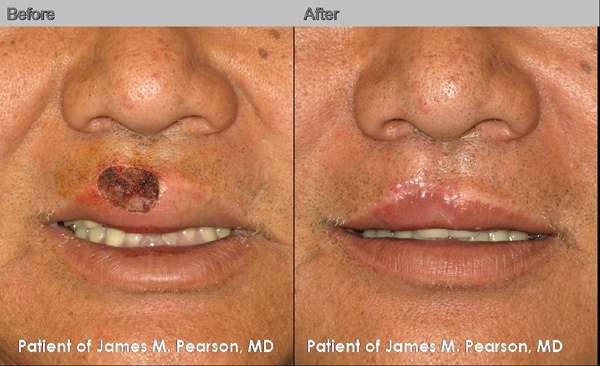 Mohs surgery allows for the removal of a skin cancer with a very narrow surgical margin and a high cure rate. Because the Mohs procedure is micrographically controlled, it provides precise removal of the cancerous tissue, while healthy tissue is spared. In anatomically important areas (eyelid, nose, lips), tissue sparing and low recurrence rate makes it a procedure of choice by many physicians. A biopsy may be undertaken in the office, and takes only a few minutes to perform. If your biopsy demonstrates a skin cancer, Dr. Pearson will discuss with you treatment options including referral to his team or your choice of Mohs surgeons for evaluation and treatment. Mohs surgery is a microscopically-controlled procedure used to treat common types of skin cancer. 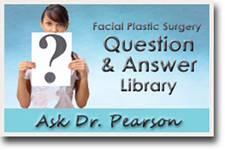 In these cases, Dr. Pearson performs facial reconstructive surgery following skin cancer removal by the Mohs surgeon. 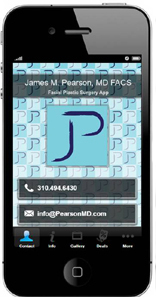 Dr. Pearson is also available to perform facial reconstruction from skin cancer surgery based entirely on your preference or request. Call our office to arrange for a consultation and we will coordinate with your dermatologist or Mohs surgeon to accommodate your treatment. 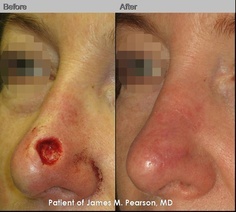 Skin cancer reconstruction is performed either in the office or an operating suite on an outpatient basis. Reconstruction is performed under local anesthesia alone or in combination with sedation based on your preferences. Patients are able to return home shortly after the procedure. Some patients choose to undergo additional procedures at the same time while they are under anesthesia. 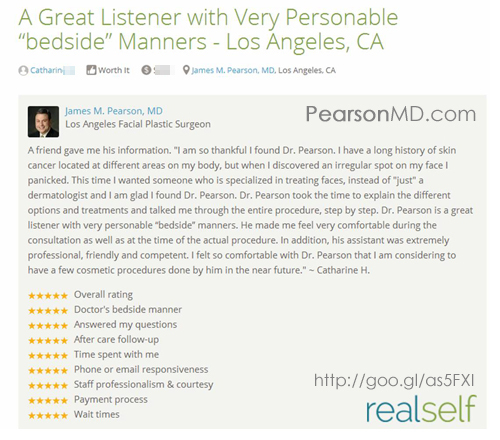 During your consultation with Dr. Pearson, complementary procedures that may be available or appropriate in your case can be discussed. Following skin cancer reconstruction, you can expect a few days of swelling and soreness which is well controlled with oral pain medications. Dressings are typically removed on the day after surgery. Sutures are removed between 5-7 days after the procedure. Makeup can be used at this point to camouflage any bruising or maturing scars. Swelling and bruising generally subside by 7-10 days. You can resume most normal activities after a couple of days, except for intense exercise, which may be resumed at about 3 weeks. Return to work is usually permissible within a few days, although most patients return to work within 1-2 weeks. 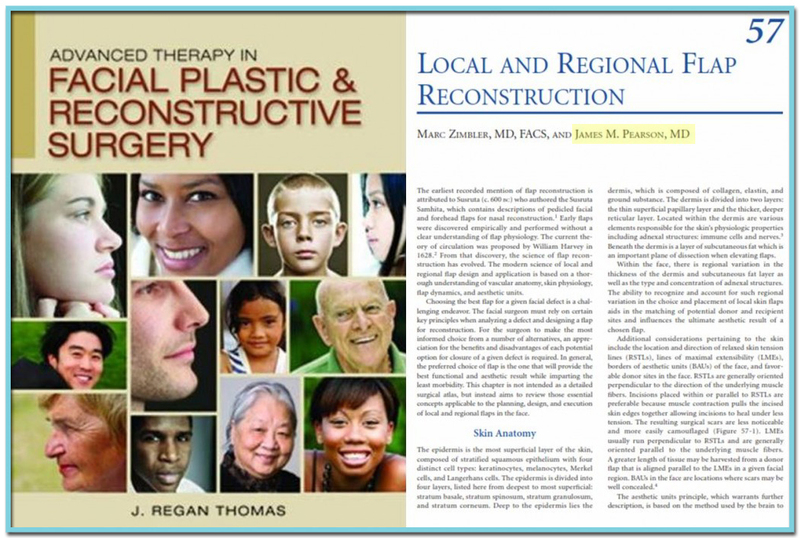 Dr. Pearson has recently published a chapter on facial reconstruction after Mohs surgery in a highly-regarded Plastic Surgery textbook.